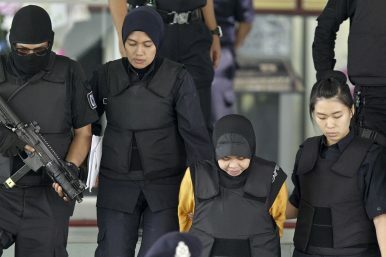 Aisyah and Doan Thi Huong of Vietnam are accused of killing Kim Jong Nam, the estranged half brother of North Korean leader Kim Jong Un. The symbolic move is aimed at putting additional pressure on North Korea over its nuclear weapons program. U.S. President Donald Trump said on November 20 that the United States would designate the Democratic People’s Republic of Korea (DPRK) as a state sponsor of terrorism in a move intended to increase pressure on the country over its nuclear weapons program. The formal designation of North Korea as a state sponsor of terrorism will take place on November 21 when the U.S. Department of the Treasury will also announce additional financial sanctions against the “murderous regime,” as Trump called the DPRK today. U.S. Secretary of State Rex Tillerson, who has the authority to designate a country a state sponsor of terrorism, was originally meant to announce a decision whether North Korea would qualify by October 31, as the State Department was required to determine within 90 days whether North Korea should be relisted due to the signing of the “Countering America’s Adversaries Through Sanctions Act 2017″ on August 2. The DPRK was originally designated a state sponsor of terrorism in 1988 by George H. W. Bush for the bombing of Korean Air Flight 858 that killed all 115 people aboard. In 2008, it was taken off in exchange for progress in denuclearization talks and the tacit promise that it would refrain from supporting international terrorism in the future. Given that the North Korea is already under extensive U.N. and other sanctions for its nuclear and missile programs, the designation will be largely symbolic, although it will likely have an additional detrimental impact on the regime’s finances. Tomorrow’s official statement must meet procedural and legal standards pursuant to U.S. law and must cite concrete examples of North Korea’s “repeated” support of international terrorism. Two examples could be used to support the official designation: the murder of Kim Jong Nam, half-brother of Kim Jong-un, at Kuala Lumpur airport in February using a highly toxic nerve agent, known as VX; and North Korean cyberattacks including the 2014 Sony hack that could be labeled cyberterrorism. Other examples could include North Korean operators jamming GPS signals of hundreds of civilian airliners flying in and out of South Korea in 2012 and repeated attempts by North Korean agents to assassinate regime critics with a poison-tipped needles in the South, next to a host of other acts that could be designated as terrorism. North Korea has also been caught shipping weapons Iran, which the U.S. also considers a state sponsor of terrorism, as well as Hamas, and Hezbollah.